In order to keep the playground safe, clean and fun for all, we have a few simple rules we ask everyone to follow. Aquarius Cove will not be responsible for any injuries, theft, loss or damages incurred while on the premises. The use of the premises is at your own risk while on premises. Each child must be accompanied by an adult at all times. Supervision of children is the sole responsibility of their caregivers. We are a shoe-free environment and we strictly adhere to the "SOCKS ONLY" policy. Socks are available for purchase. Visitors are welcome to bring their own. No food & drinks are allowed in the play area. Snacks & drinks are available for purchase at the counters. We kindly ask adults to clean up after themselves and their children. For the well-being of everyone, we appreciate you visiting us only if your child does not display symptoms of a contagious illness. For safety reasons, Aquarius Cove staff reserves the right to refuse admittance to a child if the number of children exceeds the legal capacity of our facility. Our facility is designed for children's play. Adults kindly refrain from riding, jumping, etc. on the equipment. No toys are allowed in the slides, ball pit or any other play structure. In order to keep the play area safe, we ask all caregivers to prevent children from removing balls from the ballpit. No rough play or fighting. Children who display aggressive behavior towards their peers will be asked to leave. 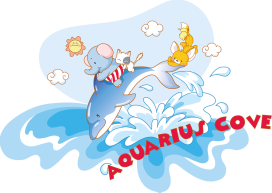 Aquarius Cove reserves the right to amend the rules herein at any time without prior notice. Parent/ Guardian will need to sign an indemnity for each child that enters our play area. Each child must be accompanied by an adult (age 18 years & above) at all times. Supervision of children is the sole responsibility of their caregivers. Aquarius Cove staff reserve the rights to refuse service to anyone.